I love this shirt! I get compliments on it every time I wear it. A quality screenprinting on a very high-quality fabric. Fantastic shirt, I absolutely Love IT! Neat shirt, I get a lot of comments on it! Love this shirt! Great material and it's nice and long. Fits really well. Bought the holiday tree tee as a Christmas present for my wife, she loved it. It is very nicely done, makes a great gift. 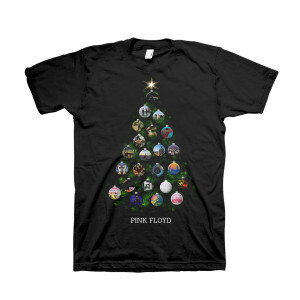 Love the Darkside of the moon shirt. Just have never bought one. I was busy buying your CD's. My favorite song is Wish You Were Here. Love Pink Floyd from the begiñning of their debut. My favorite group of all time.